Searchlights are described as an apparatus that combines an extremely luminous source (traditionally a carbon arc lamp) with a mirrored parabolic reflector to project a powerful beam of light of approximately parallel rays in a particular direction, usually constructed so that it can be swiveled around. The Royal Navy first used searchlights in 1882 to prevent Egyptian forces from staffing artillery batteries at Alexandria. Searchlights were used extensively during the war years, their brilliant beams would light up the dark night sky searching for enemy aircraft flying in the clouds high above. They became popular on carnival midways after the first world war saw a flood of them hit the market as ‘war surplus’ items. By the end of the second world war, every major show had at least one blazing away on it’s carnival midway. 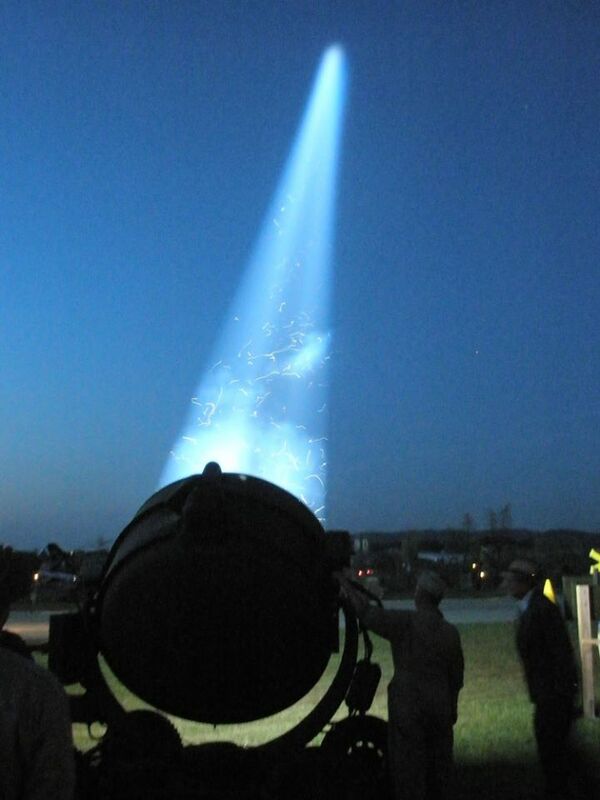 A searchlight, even at dusk, puts out a powerful beam of light that can be seen for miles . They were great advertisement for the shows, often playing a fairground or lot way out on the far edge of town. Their piercing beam could be seen slowly moving back and forth for miles in the night sky, reflecting off the clouds and letting everyone know that the big show was in town and open for business. Searchlights ran on their own fixed voltage motor-generators to provide electrical power and operated by burning a carbon rod several feet long that was slowly fed electrically into the center ‘head’ mounted at a base of focused reflecting mirrors, causing a large white hot electrical ‘arc’, much like the arc of an electrical welder, to burn with the intensity of the sun. The incredible heat they put off made a searchlight operators job hellish on a hot summers night and their intense beam of light attracted every insect for miles around, especially if the show was set up anywhere close to a river or lake. The searchlight operator had to pay careful attention to the rate the carbon rod was burning less it burn down into the head and severely damage the unit. A person operating several of the units on a large midway had to pay strict attention to his watch and move quickly to prevent a big problem. Maintenance was constant on the gasoline engines that powered them as well as polishing the lenses, reflectors and adjusting the heads. Operating these big lights was a specialized occupation that required the constant attention of a skilled man. Technology brought new, modern bulbs used in a much smaller housing package which produced almost the same amount of lumens (light measurement) that the the old arc lights did without the blazing heat and constant attention needed for the gigantic searchlights. As Army surplus goods dried up, the long carbon rods became increasingly hard to obtain and replacement parts became practically non existent. 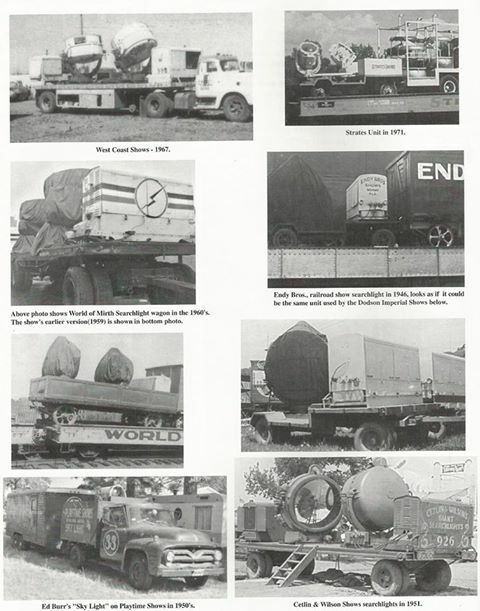 Also as the skilled operators aged, retired or passed away they also became increasingly hard to replace. Today few of these beasts remain but we have a beautiful example of one at the International Independent Showmen’s Museum in our Royal American Shows searchlight wagon patiently waiting for the day funds become available and it can be fully restored to shine it’s brilliant beam of light into the heavens once again.